Before I Fall by Lauren Oliver. Grades 9+ HarperTeen, March 2010. 470 pages. Review copy provided by my local library. Samantha always thought that right before she died, she'd see a kind of "greatest hits" playlist of moments from her life. It turns out it's not like that at all. When Sam is in a terrible car crash on a stormy Friday night, she wakes up the next morning... and it's Friday again. Is Sam destined to keep living the same terrible day over and over again forever? Or is there something she can do to change destiny and save her own life? Before I Fall is more than just a story about a popular high schooler's death. It's a story about learning that there's more to people - even your best friends - than meets the eye. It's a story about being yourself and about changing into the person you know you can be. It's a story about mean girls, but it's also a story about finding love and hoping that it's not too late. It's a story about it never being too late to make amends. Lauren Oliver's debut novel kept me riveted for all 470 pages. She has a very accessible style and right away I felt like I knew the main character of Samantha. This is important because the way Samantha changes as she relives Friday, February 12 is what the story's all about. No answers come easy to her and Sam will have to examine the way she's lived her life to figure out how to save the day. The supporting characters were fleshed out and believable, especially Sam's best friend Lindsay. Lindsay is definitely more than meets the eye and throughout the book Sam uncovers more details about Lindsay's past that explain why she is the way she is. And Kent! I loved Kent! And several rather unsavory male characters - Ms. Oliver's not afraid to write a character that made me say out loud (more than once), "Augghh! He's such a #@&*!" I can definitely see why this 2010 debut has been garnering praise all over the blogosphere. Check out more reviews at bookshelves of doom, DJ's Life in Fiction, The Reading Zone, Galley Smith, Reading Vacation (who reviewed the audio book! ), YA Librarian Tales, Pop Culture Junkie, and Persnickety Snark (among others!). I'd recommend this book to teens who like books that make them think about issues... like Hate List by Jennifer Brown or maybe Carolyn Mackler's books. 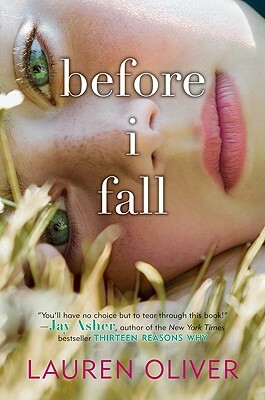 Before I Fall is on shelves now!